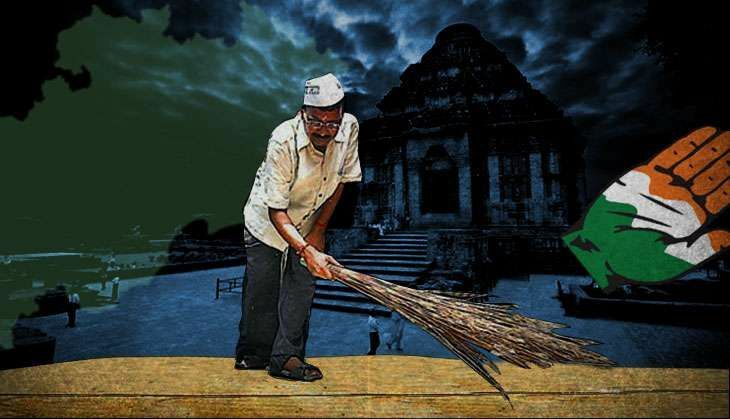 The rising clout of Aam Aadmi Party (AAP) in Odisha has unnerved the Congress that has been playing second fiddle to the ruling Biju Janata Dal (BJD) for the last 16 years. Combined with infighting within the state unit, experts believe the grand old party is slowly losing its political space to a resurgent AAP that seems to have made significant inroads in rural Odisha. Faced with crucial panchayat polls in February wherein all political parties have started their preparations, Congress is battling dissidence within its ranks. Recently, 16 legislators of the party were in Delhi to meet Congress vice-president Rahul Gandhi and sought a change in state leadership. Also read - Odisha: why did MLAs rile Naveen Patnaik by prostrating before him? Led by the leader of opposition Narasingha Mishra, the legislators requested the Gandhi scion to replace Odisha Pradesh Congress Committee (OPCC) president Prasad Harichandan. They argued how Harichandan has not been able to stem rebellion and carry everyone along before the panchayat elections. However, the Congress vice president shot down their request and requested the party men to work together before the ensuing panchayat elections. They then sought an appointment with Congress President Sonia Gandhi. The central leadership is in no mood to make any significant changes in the state leadership as it feels this would send a wrong message to workers who would think that the high command succumbed under pressure. Congress legislators are pitching for former OPCC president Niranjan Patnaik to take over from Harichandan. So much so, party functionaries claim that the demand to replace Harichandan is likely to get louder after the panchayat polls. They did not even rule out the possibility of this faction breaking away from the party to form a new outfit or join another party. The central leadership is well aware of this growing factionalism and is closely watching the proceedings before taking any corrective action. In fact, the Mishra-led faction has been working on its own for quite some time now and the recent meeting Mishra convened an all party meeting on the Mahanadi dispute in Bhubneshwar. Harichandan was not even consulted and he chose to stay away from the crucial meeting. These differences are likely to hurt the party's prospects now that it is also facing heat from the AAP. And it was for this very reason that the central leadership came out with a list of panel members for the panchayat elections for the first time ever. This list is usually the prerogative of the state unit that also releases it locally. But this time around, Congress general secretary Janardan Dwivedi in a statement released names of party leaders for pradesh election committee, manifesto committee and district in-charges. Dwivedi added that these leaders were chosen in consultation with Congress president Sonia Gandhi. In addition, the party has assigned all top leaders in the state different districts to strengthen it presence before the panchayat polls. Having been in power in the state since Independence, the party lost out to Naveen Patnaik in 2000 who has been the chief minister ever since. Ever since then, the grand old party's electoral fortunes have been plummeting in the state and the 2014 assembly election results was the case in point. Out of a total of 147 seats, Congress managed to win only 16 and they have raised the banner of revolt against Harichandan. With these developments, Congress' position as a challenger to BJD has come under severe threat with both BJP and AAP working hard to strengthen its foothold in the state, especially rural Odisha. Even the 2014 Lok Sabha elections have given BJP hope to increase its vote share in the state which increased to 21.5% in 2014 as compared to 16.89% in 2009. On the hindsight Congress' vote share had shrunk by 6%. Meanwhile, BJD is unperturbed by a resurgent AAP and BJP and believes that its vote share is likely to remain intact and that these two parties would rather eat into Congress' vote share. Meanwhile, AAP is planning to play the development and corruption card to upstage the BJD and how despite 16 year of Patnaik's rule, the state continues to be one of the poorest in the country. In a massive show of strength, AAP recently held a rally in Cuttack where it claimed to form the government in 2019. "What has BJD given to Odisha within 17 years of rule?" questioned AAP leader Ashutosh in Cuttack who went on to add that the AAP would become an alternative to Patnaik.